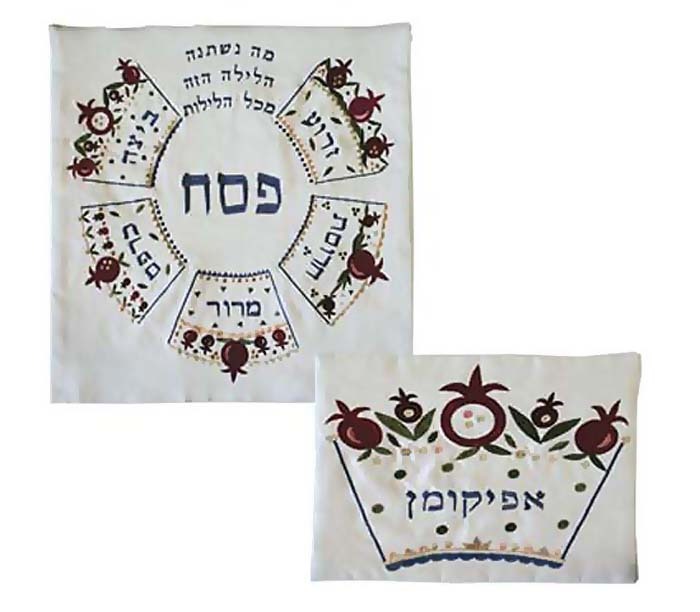 This square matzah cover has colorfully embroidered crown-shaped panels with pomegranates accents. Each crown has one of the Seder symbols embroided in Hebrew inside. All crowns encircle the word Pesach in Hebrew, with the addition of the quote 'Ma Nishtana HaLayla HaZeh Mekol HaLeylot' [Why is this night different from all other nights]. The matching Afikomen bag has the word Afikomen in Hebrew inside one pomegranate crown panel. Hand-wash after use.